Another lovely week has gone by. Lots of interesting things happened on Stardoll, the major event being the Stardoll celebrating 10 years of site existence. I can't believe it's been so long, and it is even less believable I dedicated over 8 years to this game. One of the main reasons I stayed is because of my love and passion for writing, and especially since I got accepted as a Starblogger. On Monday, we got new collection in Fantasy Hotels interior store. The items give away impression of luxury and fortune. I am especially loving the interior, it resembles one of super expensive hotel underwater rooms. I love the dress, too. (In fact, my doll is wearing it at the moment.) From delicious drinks, comfortable chairs, and the wonderful look, this collection is a dream come true for fans of rich looking suite. On Wednesday we got new Callie's Picks collection, named 'Celebrating 10 years'. The collection marked a start of 10years of sd campaign, and it consists of various old and fairly cheap items, with no less than 10(!!) starcoin items. I am seeing many nice items, several Mortal Kiss items. (I am still waiting for that mk wolf to be re-released though.) There are many items from different periods of Stardoll, including some freebies. Which is ok, in case some members missed it. Anyway, it is a nice collection, not my favorite, not least favorite either. 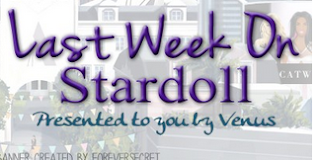 On Thursday, Stardoll announced 50% off leaving sale at Nelly.com selected 5 floors. I already have most of the stuff I like, because, as I mentioned several times, Nelly.com is one of my favorite, if not THE favorite store on Stardoll. Sale is great, and you can catch some fantastic deals and buy stuff you can use well in the future. Pieces are trendy, perfect for young adults, in real life at least. In fact, when i am done with this recap, I will be visiting the store to buy stuff I may have missed. Also, hoping for new collection on Monday. Friday is ok too. The same day, Stardoll announced the start of their 10 year anniversary campaign. For 10 days, we will get to be reminded of a big moments of a game, big updates, read stories from Stardoll members, and get some cute gifts as well. Like I said, it is amazing game stayed for 10 years, and even more how some users (me included) have stayed loyal for a very long period of time. I am loving the campaign so far, and gifts are really good, I am looking forward to some others. And of course, congrats, Stardoll, for 10 amazing years! And on Friday, we got new Rio collection. Items are fairly nice, though they seem kinda random. Still, I like some of the items, and even 2 starcoin items are pretty decent. An ordinary collection, for members who prefer quantity over qualify, (Not saying the items lack of quality, just comparing it to other limited and/or expensive stores. ), or who don't want to pay too much for clothes on Stardoll. Anyway, a nice, entertaining week. We can expect the continuation of 10 years anniversary campaign, maybe new YH collection - who knows? So vote, comment, and see you soon.